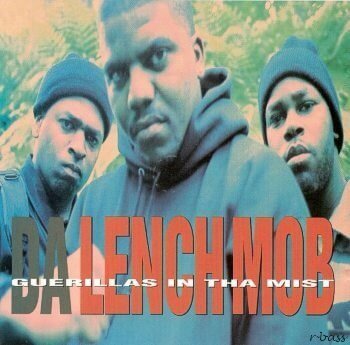 “Guerillas In Tha Mist” is the title track an lead single of Guerillas in tha Mist, the debut studio album by Da Lench Mob. The album was produced by Ice Cube, who is also featured throughout the album though uncredited. The album peaked at number 24 on the Billboard 200, number 4 on the Top R&B/Hip-Hop Albums, and was certified gold by the Recording Industry Association of America on December 18, 1992, indicating US sales of over 500,000 units. The album title is a pun on the popular movie title Gorillas in the Mist and guerrilla warfare. In the post-Los Angeles Riot atmosphere of the album’s release, the title was also perceived as a clever reference to a comment made by one of the police officers who had arrested Rodney King. Laurence Michael Powell, one of King’s arresting officers, had described through radio message a domestic disturbance involving two blacks as something straight from “Gorillas in the Mist”. Powell’s comment was seen as racist, comparing blacks to gorillas, and was used against the officer during the Rodney King trial.